EDINBURG, Texas — A Texas U.S. Border Patrol agent was arrested after he allegedly tried killing the mother of his child when she tried to end their romantic relationship. Ricardo Cepeda Jr., 33, turned a gun towards his girlfriend and opened fire in the presence of their one-year-old baby girl early Sunday morning, according to Edinburg Police. The 11-year-veteran of the Border Patrol is facing charges of attempted murder and endangerment of a child. Ricardo Cepeda Jr., 33, stands inside the Edinburg municipal court to face charges. Investigators said the incident took place shortly after 3 a.m. at the 3300 block of Zoe Ave. in Edinburg, where they found Cepeda’s girlfriend Brenda Hernandez, 34, inside an SUV with two gunshot wounds to the upper back. Hernandez told police she believed Cepeda had fled with their baby to nearby Weslaco where he was detained. However, police found the unharmed baby inside their home. “It sounded like someone had a hammer, pounding against our wooden fence,” recounted Cepeda’s neighbor Pristela Urbina. Hernandez is recovering at a hospital and is in stable condition, said police. 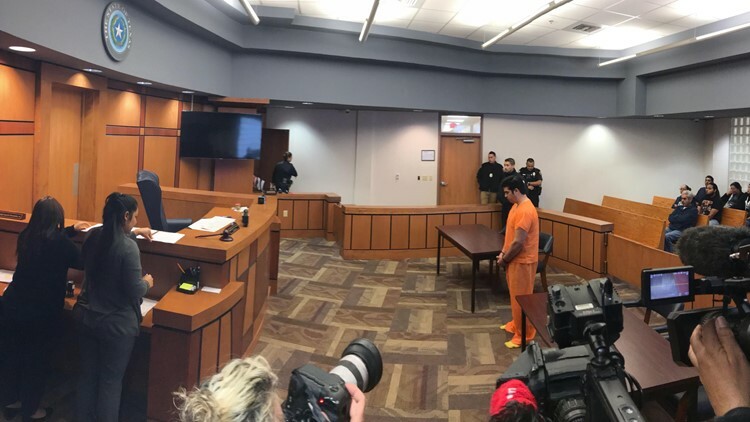 “What was disturbing was that she reported that Cepeda was holding the child at the same time that he was discharging the weapon towards her,” noted Edinburg PD Lt. Oscar Treviño. The incident is one more in a series of cases in less than a year involving off-duty Border Patrol agents in Texas accused of going rogue and using firearms to cause harm. An internal U.S. Customs and Border Protection report issued in late 2018 shows a total of 248 off-duty agent arrests between FY 2016 and FY 2017. Domestic violence rose from 44 to 51 cases, while violent crime jumped from 1 to 3 cases during the same period. “This is an isolated incident and this in no way should reflect negatively against our U.S. Border Patrol agents,” highlighted Treviño. Cepeda is one out of roughly 19,000 Border Patrol agents. CBP said it's cooperating with the investigation, and indicated Cepeda is now in a “non-duty” employment status.